If you think about it, babies are graphic testimony of God’s sustaining providence. Recently I saw again the dystopian movie Children of Men. It’s set in the near future in which some global pathogen or environmental toxin prevents pregnancy. After a few years, there’re no children in the world. It’s a scary scenario, but it’s not going to happen. God created man and woman to steward his glorious creation for his own glory (Gen. 1:28–30). Mankind is God’s deputy in the earth. Man’s job won’t be finished until Jesus returns to usher in the eternal state. So we needn’t worry about man’s being exterminated. Man is God’s deputy, and man will be around earth for a long time. Babies are God’s means of keeping his deputies going on — and keeping the world going on. Babies aren’t a freak of chance evolution. Babies are God’s design. Babies are proof that God is continually sustaining his plan for the earth. But the earth has fallen into sin, and as Christians we must bring up our children in a sinful world. This is nothing new, of course (sin has been around a very long time); but in our own time, our culture is turning radically away from God’s truth. We call this apostasy: abandoning God’s path. Apostasy doesn’t involve just actions. It starts with sinful thinking. In fact, it’s the sinful thinking that leads to sinful actions. The thinking about child training surrounding us — including sometimes by friends and relatives — is apostate thinking. A great danger confronts us Christian parents every day: are we adopting this apostate way of thinking about rearing our children? We must constantly be on our guard, because very few of the child-rearing ideas surrounding us are God’s ideas. Today I want to address three biblical truths and exhort us to follow those truths rather than the apostate untruths in our surrounding culture. I’m not sure how many of you saw the August 12, 2013 cover of Time magazine. The lead article was “The Childfree Life: When Having It All Means Not Having Children.” As you can probably figure out, this article is not about marriages that are simply unable to produce children. Marital infertility is an aspect of God’s providence. And marriage that can’t produce children is not a second-class marriage. We know this, because God created Adam and Eve, before they bore children, and he said that his creation, all of it, was “very good” (Gen. 1:31). In other words, children are not required to have a very good marriage. But that’s not what the Time article is talking about. Instead, it’s talking about spouses who intentionally refuse not to have children in order to enjoy their self-centered existence. This narcissism is not an example of providential childlessness; it’s an example of sin. How do we know this? Because the Bible commands spouses to have children if we are physically able (Gen. 1:28). One of the main reasons that God brings a man and a woman together in a marriage is to produce covenant children (Mal. 2:15). To have an intentional childless marriage, therefore, is rebellion against God. Increasingly, this is the world’s way, and it is the sinful, rebellious way. Don’t buy into it. Psalm 127:3 tells us that children are an inheritance and reward from the Lord. Children are a blessing. You spouses and parents need to know this, and your children need to know this. They’re God’s gift to you parents and others surrounding them. Never call them a “little accident.” Never treat them as though they are a bother. Remember: they’re a big part of God’s providence to keep the world moving forward for his glory. Tell them this. Bring them up in a church (like Cornerstone) that treats them as part of the church — because they are. Children don’t become a part of the church when they arrive at a certain age. By baptism they’re marked out as God’s covenant children. They partake of communion. Paul calls them holy — meaning, they’re set apart for God’s use (1 Cor. 7:14). If you let your children know that they belong to God, and that Jesus’ blood was shed for them and God’s precious promises are their promises (Ac. 2:38–39), they can live in a great spiritual comfort and security. No, children aren’t “born Christians,” but children of Christian parents are born into the Christian church. They’re meant to be nourished in the Gospel and educated in salvation. This isn’t the world’s way, but it is God’s way. 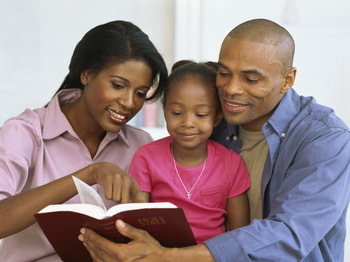 In Ephesians 6:4 Paul writes that fathers should bring up children in the discipline and instruction of the Lord. Actually, the term translated “fathers” also means parents. It’s similar to our use of “forefathers”: meaning, our ancestors, both male and female. Parents are called not to anger their children, but to instruct them and make them disciples of Jesus. The world’s way is antithetical to God’s way. The world’s way of child rearing is increasingly the way of freedom of self-expression: “Don’t stifle your child’s creative spirit. Don’t tell your child that he or she is wrong. Don’t do anything to dampen your child’s self-esteem.” This is the world’s way, and it is not God’s way. Children are born into sin: “Behold, I was brought forth in iniquity, and in sin did my mother conceive me” (Ps. 51:5). Why wouldn’t they be sinners? We parents are sinners. No one needs to teach children to sin; parents need to teach children to obey. We live in a time in which many people believe that our society and our environment corrupt us. We’re actually very pure and sincere in our hearts, but their internal goodness is corrupted by our society. Therefore, if we can all just “follow our heart,” including, perhaps especially, our “innocent” children, we’ll end up right. According to God’s way, this has things just backwards. Because our heart is sinful, when we follow our hearts, we end up wrong. That’s why our culture is so evil: because we all do follow our heart! We need a new heart. This is what the Holy Spirit gives us in the gospel of Jesus Christ. This is why we must teach and admonish children. We can’t assume that they have pure hearts. Our job as parents is to train them in the Gospel and in the truth. Paul says we are called to discipline our children. This means to make them disciples. It means the entire process of training. In other words, to use modern language, parents must be pro-active. Don’t allow your children simply to live and act, and then respond to them. The next word for Paul is “instruction.” This word really focuses attention on language, what you say. If you’ve read the Bible, you know that God likes to talk to us, and he wants us parents to talk to our children. They need for us to tell them what is right and what is wrong, what is wise and what is unwise. Our attitude can never be, “Well, I’ll let them make up their own mind.” One of the cruelest things we can do to our children is to abandon them to their own life choices: “The rod and reproof give wisdom, but a child left to himself brings shame to his mother” (Prov. 29:15). That last verse brings up another important truth. Our secular world is increasingly opposed to all spanking, corporal discipline. Because of the comparatively infrequent incidents of child abuse, many parents equate ordinary spanking with abuse. This is simply wrong, and it’s a godless approach. This biblical teaching will test our fidelity to God’s word. None of us enjoy spanking our children, but if we do not, we are not following the word of God. We spank her children, when necessary (and it shouldn’t be necessary too often), because they need to learn at a young age that the consequences of sin are painful. If we constantly insulate children from the painful consequences of their sin, including painful physical consequences, we’re teaching them that God’s world is not governed by his law. We’re teaching them to be lawless. We’re teaching that sin doesn’t hurt them physically. This is cruelty. They must understand God’s moral universe, and a small but important part of understanding that universe is understanding that sin is painful, and sometimes physically painful. We must stand with God’s word against the world’s way in discipling our children. Finally, Moses teaches in Deuteronomy 6 that were called to drench our children in God’s ways. Did you notice the language in verses 8 and 9? The Jews later took these verses quite literally. They attached little leather containers to their heads and their arms containing scraps on which God’s word was written. They put little boxes containing these scraps on the doorframes of their homes. I don’t think this is what Moses was specifically talking about. He was speaking metaphorically. But at least the ancient Jews understood the gravity of this point. We should surround our children by God’s truth and God’s ways. Now, before I tell you how to do that, let me remind you that this approach is totally different from the world’s approach. This really is a practical outworking of a secular culture. And if we do this, we teach our children that following Jesus isn’t really important. At best, it’s a mildly important, tiny part of our lives on Sunday morning. We can be good Christians on Sunday morning, and good secularists the rest of the week. But I must say: there is no such thing as a sacred-secular distinction. There’s only a sacred-profane distinction. Whatever it is, if it doesn’t honor God, it profanes God. In other words, there are no permissibility secular things. Everything either honors God, or it does not honor God. What are the applications of this in training our children? First, we need to understand that our secular society doesn’t reinforce our Christian truth. In most cases, what our children encounter in the world is going to be contrary to God’s ways. I mean magazines in the grocery store. I mean the way many unbelievers dress. I mean much of what they see on TV. I mean how most people talk. Yes, that’s exactly what I’m saying. And that’s why we must constantly be teaching our children, all the time, about God’s ways. When they encounter a self-centered boy or girl throwing a tantrum at the grocery store, use that as a teaching moment — we are not our own; we belong to Jesus Christ; we don’t always get our way. We want to please Jesus, not ourselves. When your children see lascivious, fornicating dancing on TV, use that as an occasion to teach them about sexual purity, even at a young age. When your son or daughter hears the neighbor or somebody on TV taking God’s name in vain or using scatological language, tell them what the word of God says about such sinful language, and about the language to God requires. Most important, we must nourish our lambs in the Gospel. It means that, again and again, we must tell our children that although we are sinners, Jesus died on the Cross for our sins, and he will save us and be our Shepherd as long as we trust in him. Teach them over and over that Jesus is our Shepherd, and that the Shepherd leads us by his word, and that we should know and love his word. It leads us into paths of righteousness. We should teach them that the Shepherd will take care of every need we have and that we should pray to him at all times, in all conditions. Our world is so secular, that nothing short of immersing our children and God’s ways will suffice. Let’s review: (1) the world’s way is that children are a bother; God’s way is that children are a blessing; (2) the world’s way is that children are to be left to themselves to express their inner goodness; God’s way is that parents should lovingly disciple them; (3) the world’s way is that society should be secular; God’s way is that children should be immersed in the Gospel of Jesus Christ and in his paths of righteousness. The calling of Christian parents is to forsake the world’s way for God’s way. Lauren Sandler, “The Childfree Life: When Having It All Means Not Having Children,” Time, August 12, 2013, 38–45.